We are in the midst of change in our country, world and in our lives. We have learned that change is a constant and we have successfully adapted to many changes with technology, political shifts, family changes and aging. Even so, change is not easy. Changing is particularly hard when we feel uncertain and ungrounded. It is easy to imagine the worst and to feel afraid. A part of us wants to hold onto what we have and resists change. When we are stressed we experience contraction and we literally don’t have access to the part of our brain that experiences possibilities. We need to be resilient. 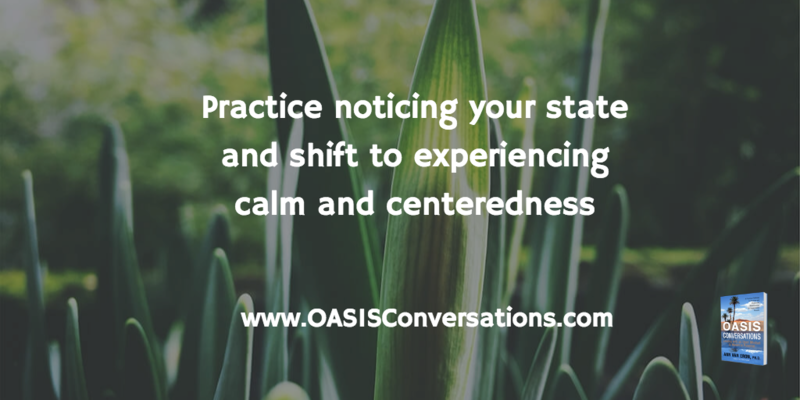 Ideally, we make it a practice to continually notice our state and shift to experiencing calm and centeredness. I liken this to being in an oasis rather than in the drought of the desert. Research shows that we can build new neural pathways that will help us to shift to this oasis state more readily. From this state, we can be more resourceful. Check in on your state of openness on a regular basis—perhaps at stoplights or as you enter new rooms or when the phone rings. Simply notice and name your emotion and then recall your commitment to being open. You may recall all the times you have successfully handled disruptions and trust that you will navigate new changes. You may envision people who support you and care for you and remember that you are not alone. You may experience gratefulness for all that you have and trust that things will work out. In a state of resilience and openness you will be more prepared to find opportunities in the disruption. Your openness will support those around you in being more calm and open and together you will find solutions. What supports you being calm and centered amidst change? This entry was posted in Communication, Self Awareness by Ann Van Eron. Bookmark the permalink.